We’re not surprised one bit to be seeing our amazing Team HMF runners Kimberly Markey and Katie Edwards among the leaders of the Runner’s World Cover Contest. They each embody the best of what rock star runners can be – inspiring others by running with passion, living to the fullest and encouraging those around them. Learn a little more about them below and support them in this journey by casting a vote daily. The contest ends 8/26/14. Running has become my release and therapy. I pass on my love of running by volunteering for the Hartford Marathon Foundation coaching run/walk/run first-time marathoners. I now know running is NOT only about the bling it’s much, much more. Running has taken a 36-year old woman who was trying to survive not having a nervous breakdown to a 42-year-old SURVIVOR. 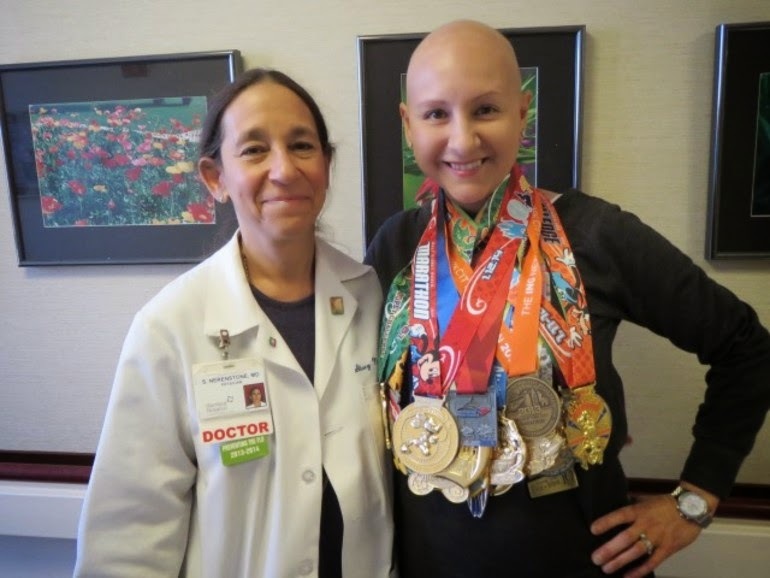 Running got me through business lawsuits, personal bankruptcy and most recently breast cancer. I now know I can survive anything and I can do whatever the heck I want to do because I run. It’s that simple. I was 25, 8 months pregnant, a 13 month old at home and a melanoma diagnoses. After an induced premature delivery and surgery one week later, I learned life waits for no one. Now I have big goals and am determined to make them happen. I know that the seemingly impossible IS possible. My life flows when I am running and working hard. Running gives back what I put in - strength, determination, belief in myself - and allows me to share that with those around me. I LOVE seeing people discover themselves in running. We have been celebrating the joy that running brings to women as we approach this Saturday’s Red Dress Run. Women of all ages, shapes, sizes and abilities who run for their health, for their enjoyment, or simply for themselves. While nobody can take away a woman’s right to run, it’s shocking how relatively recently women runners have been restricted from racing. After a 32-year ban due to medical concerns that the event was too taxing for the "frail" female gender, the women's 800 meters was reintroduced in the 1960 Summer Olympics. But it was far from smooth-sailing for women's racing from there. In 1961, the Amateur Athletic Union (AAU) bans women from competing officially in all U.S. road races. 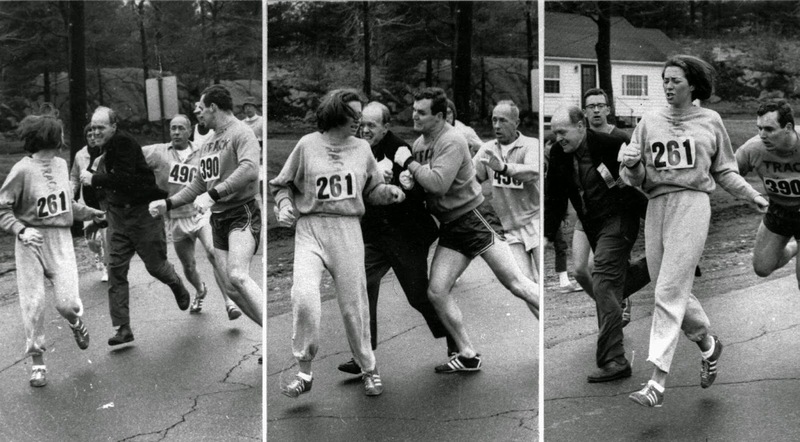 Nineteen-year-old Julia Chase enters a 6.5-mile road race in Chicopee, Massachusetts, in an attempt to challenge the ban. While her run garners media attention, her plight is largely regarded by critics as a spectacle. In advance of her historic renegade Manchester Road Race later that year, the New York Journal American writes: "Miss Chase said she is 5’4” ½ , weighs 118 pounds and does not know her other dimensions. (Eyewitnesses report her other dimensions are very good.)" In 1977, fed up with feeling uncomfortable while exercising, runners Lisa Lindahl, Polly Smith and Hinda Schreiber fashion a top out of two jockstraps sewn together, nicknamed the “jockbra”. The sports bra—later renamed Jogbra--is born. Moving Comfort is founded the same year, and releases the first women-specific running short. 1979 - Grete Waitz takes her second first-place finish in the New York City Marathon in 2:27:33, shattering her own world record, and becoming the first woman in history to finish 26.2 miles in under 2.5 hours. After years of hard work and lobbying by passionate female and male athletes alike, the women's Olympic Marathon makes its debut in the 1984 Los Angeles Summer Olympics. American runner Joan Benoit becomes the first female gold medalist in the event. She later says of running the final leg into the Olympic stadium: "Once I passed through that tunnel, I knew things would never be the same." 1986 - The first jogging stroller is made, allowing mom runners everywhere the freedom to run whenever and wherever. In 25 years, a rich history of women runners in the US gives us much to celebrate. And it only gets better from there! 2013 - For the first time in history, 61% of U.S. half-marathon finishers were females (approximately 1,196,000 - a record), the highest proportion of any race distance. 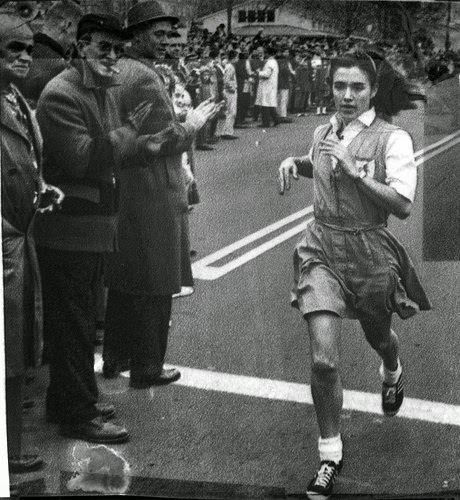 *Come see Kathrine Switzer, a special guest of the 2014 NU Hartford Marathon. Details to come.